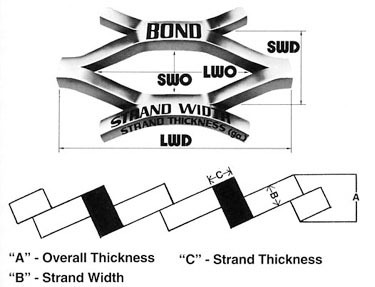 BOND - Intersection of two strands. Always equal to the width of two strands. LWD - Long Way of Design - Distance from a point on a bond to a corresponding point on the following bond measured across the Long Way of Design. Also referred to as “pitch LWD”. LWO - Long Way of Opening - Distance measured from the inside of the bond across to the inside of the bond LWD. 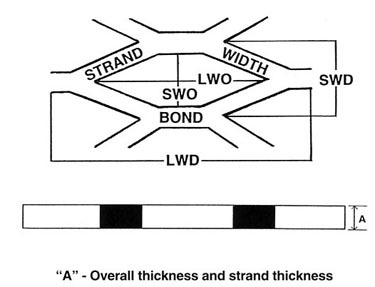 OVERALL THICKNESS - Actual measurement of the thickness of the mesh measured at the bond. Standard Expanded Metal: Gauge or thickness of the sheet or coil from which the expanded metal was produced. Flattened Expanded Metal: Overall thickness of the finished sheet. Standard Expanded Metal: Amount of metal fed into the expanding machine, which is slit and stretched with each stroke of the upper die. Flattened Expanded Metal: Width of the	strand. SWD - Short Way of Design - Distance from a point on a bond to a corresponding point on the following bond measured across the SWD. Also referred to as “pitch SWD”. SWO - Short Way of Opening - Distance measured from the inside of the bond across to the inside of the bond SWD.